Many know Resort at Squaw Creek to be North Lake Tahoe’s most complete resort; mountain biking, guided hikes, and tennis are all steps from Resort at Squaw Creek’s door. The Resort’s outdoor recreation department, known as High Altitude Adventures, also offers Mountain Buddies, a comprehensive program that introduces children ages 4-12 to mountain recreation and activities. Also during the summer months, guests can enjoy the on-site Robert Trent Jones, Jr. Championship Golf Course, river rafting on the nearby Truckee River, miles of bike trails and variety of water activities at Lake Tahoe. 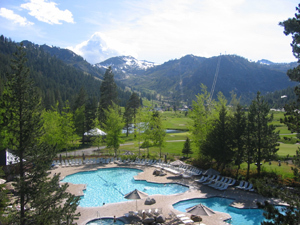 Resort at Squaw Creek is a Destination Hotels & Resorts-managed property. Recently recognized as one of Condé Nast Traveler’s “Top 50 Ski Hotels” in North America, the 405-room and suite Resort at Squaw Creek is situated at the base of Squaw Valley USA, home of the 1960 Winter Olympics, and just five miles from Lake Tahoe. The property features diverse dining options, a full-service spa, and a year-round pool complex with seasonal waterslide and an exclusive on-property chair lift accessing Squaw Valley USA’s world-class ski terrain.